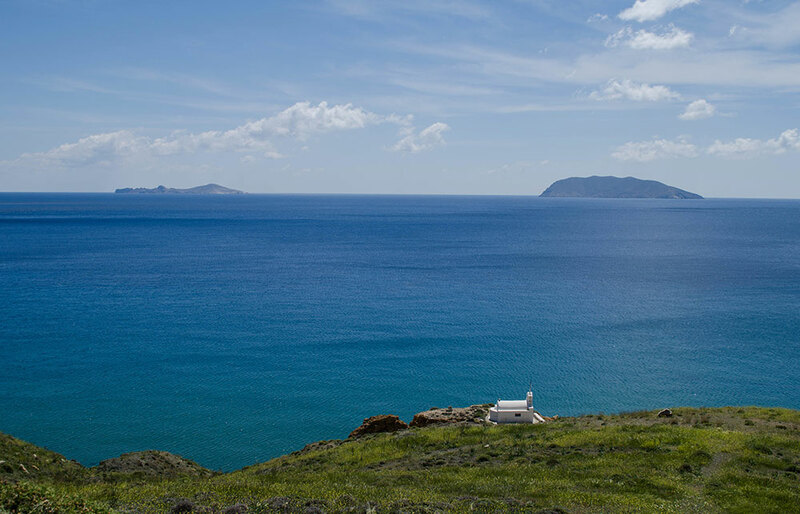 Anafi is a secluded oasis at the very edge of the Aegean Sea that has remained unaffected by the passing of time. Those who have visited the island feel like they have discovered a small paradise, a quiet retreat, in what seems like the “edge of the modern world”. 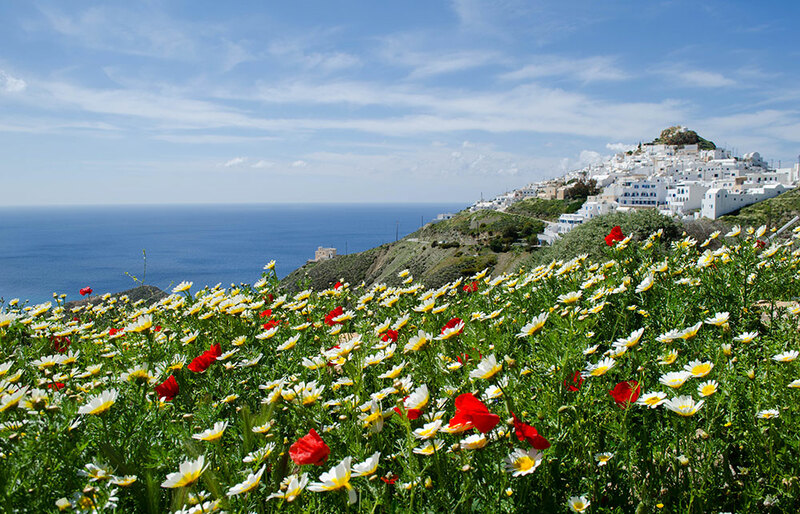 Located right next to Santorini, Anafi shares the same wild landscape, due to the volcanic activity in the area. Rock formations with whitewashed houses, golden sands and dark green waters, this island is a unique place for those looking to break away from the hectic lifestyle of the contemporary world and experience a simpler way of living along with its welcoming residents. 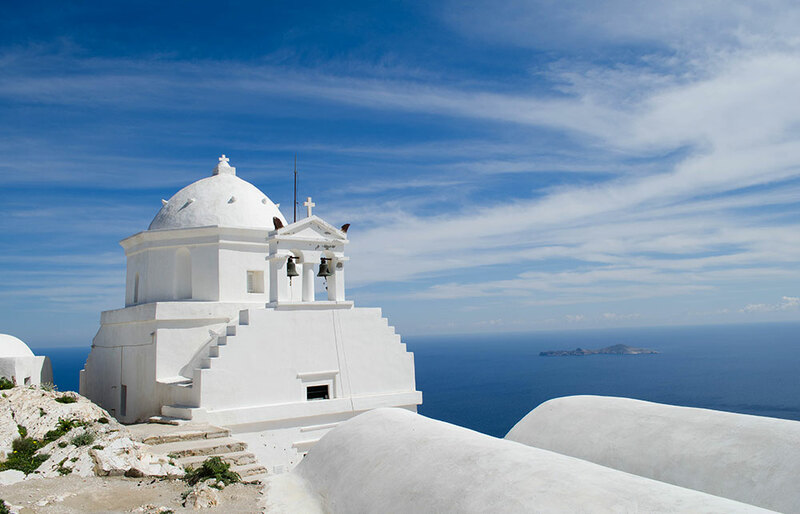 Anafi truly is a remote jewel for travelers who wish to explore virgin and otherworldly landscapes. Boats reach Anafi only a few times per week (the easiest way to get here is to fly into Santorini, then board on a ferry which takes just a couple of hours, rather than a long ferry trip from Athens), thus reinforcing the fact that only a handful of visitors will enjoy what the island has to offer. 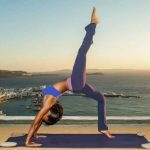 Isolated in its simplicity, Anafi and its 270 inhabitants offer necessary services to travelers based on a schedule. Here you will find one gas station open for 1,5hours 3 times per week, a few restaurants and cafes, a medical center and a local police station. Most beaches are secluded and none is organized, accessible only by boat or on foot. Few sport activities are also available, such as sea kayaks or horseback riding. However, in Anafi you will learn the locals by name. They are heartwarming and friendly people who always greet anyone they come across. On the plus side, since the locals do not speak good English, you can brush up on your knowledge of the Greek language during your visit. Ancient City - The ruins of the Anafian city-state called Asty established in the 8th century BC by Dorian colonists are seen in the Kastelli hill, along with other important findings from the Roman period, in which the island flourished. Ancient Port “Katelimatsa” - Anafi’s ancient port, most of which is sunken below the sea. Archaeological Collection - Statues and excavations findings from the Ancient City are displayed in Chora. Caves there are many unexplored caves in the island. The best known is Drakontospilo with natural ponds and plenty of colorful stalactites. It is located on the northern part of Kalamos and is very difficult to reach. Another well known cave with stalactites and stalagmites is in the area Prasa. 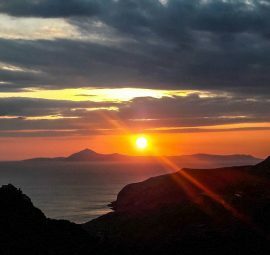 Mount Kallamos - The second largest rock in the Mediterranean after the rock of Gibraltar, undoubtedly Anafi’s jewel. A unique natural monument of major geomorphological significance. 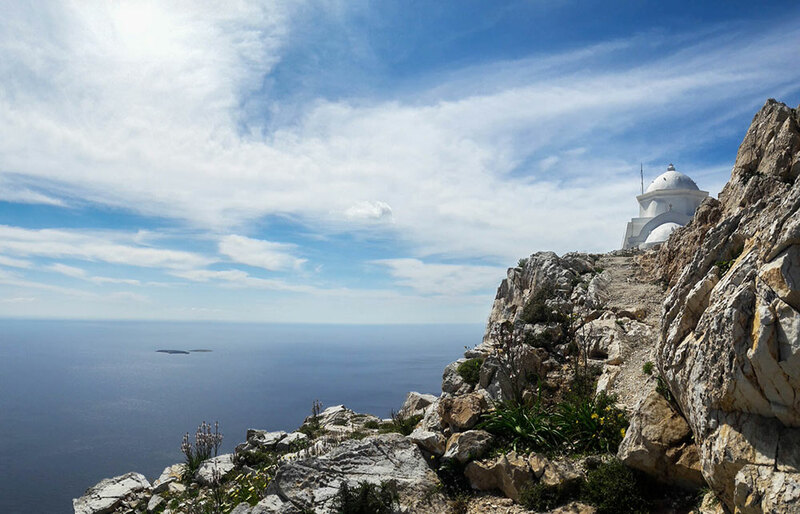 It takes approximately 1 hour hike to reach the top (at approximately 484 meters above sea level) where you can experience the most breathtaking views from the Monastery of Panagia Kalamiotissa which is a must see for all nature lovers and hikers. Pyrgi Castle ruins - An observatory in the southwest side of the island. Venetial Castel - Chora is built on the ruins of a Venetian castle used as an observatory of the Cretan Sea. Vigla Mountain - The highest mountain of Anafi, rises to an altitude of 584 meters. The path is narrow and rough but the view from the top is very rewarding. 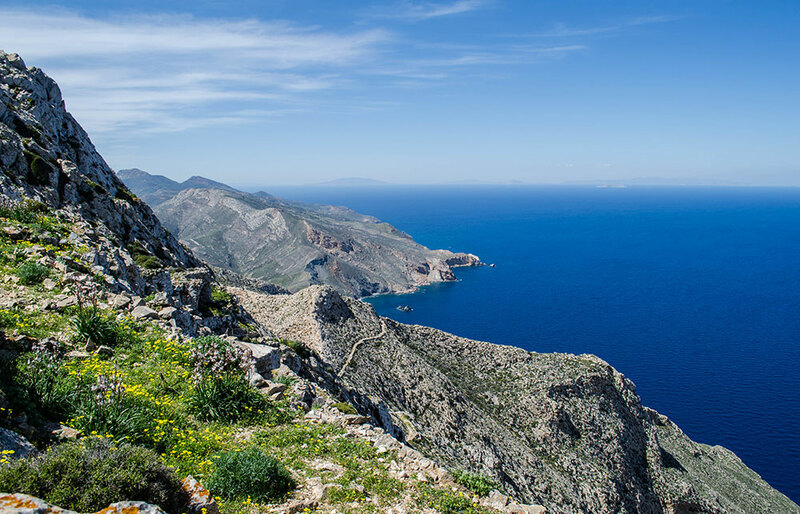 In a clear day you can see the view of the entire island of Anafi and as far as Astypalaia, Amorgos, Ios, Naxos and Santorini. 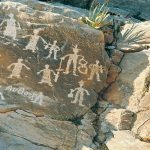 In the ancient years (1000 BC) it was used from residents as a place to make fire signals for telecommunication. ZoodochosPigi Monastery - Beautiful Monastery on the eastern part of the island, built over the remains of an ancient Temple of Apollo (sections of which can still be seen today) in the 17th century. It is surrounded by stunning gardens with all sort of flowers, trees, plants, decorations and even caves and has a beautiful view of the island and the sea. The monastery is a popular trekking destination. 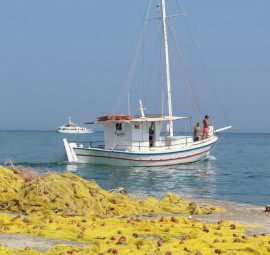 The route from Chora is an hour long and crosses almost the entire island. 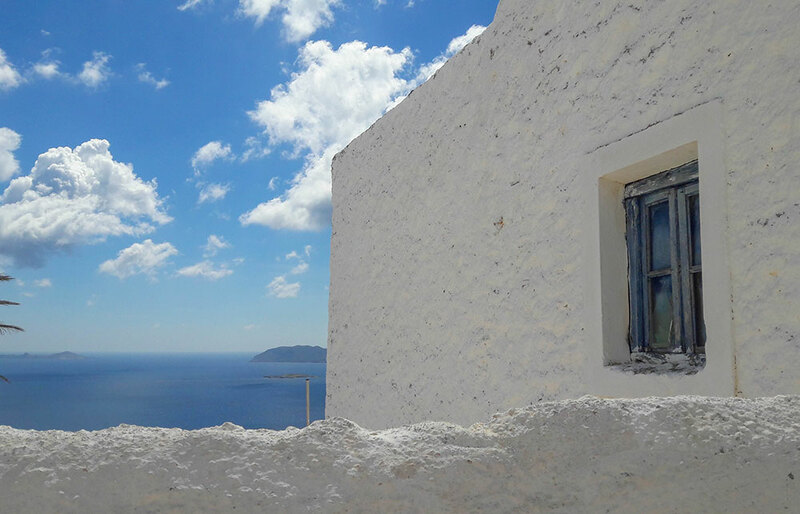 Chora village, the capital of Anafi, is one of the most authentic and unspoiled villages in Cyclades, with whitewashed houses, paved roads and old windmills. It is built on a natural amphitheatrical site, above the port at an altitude of 260 meters. There is a small asphalt road connecting the 3 km distance that separates (part) Chora from the port. Occasionally there are buses to Chora and back, but no car rentals at the port. Chora is also pedestrian friendly and off–limits to vehicles. In its narrow picturesque streets there are white houses, old and new churches, few traditional taverns, a bakery, a grocery, a couple of bars and several rooms to let available. The paved roads lead to the remains of the old Venetian Castel at the top of the settlement. Findings of the ancients Anafi can be seen in the Archaeological Collection. Kleisidi is the second unofficial settlement of the island after Chora and is located close to the island’s port (Agios Nikolaos). 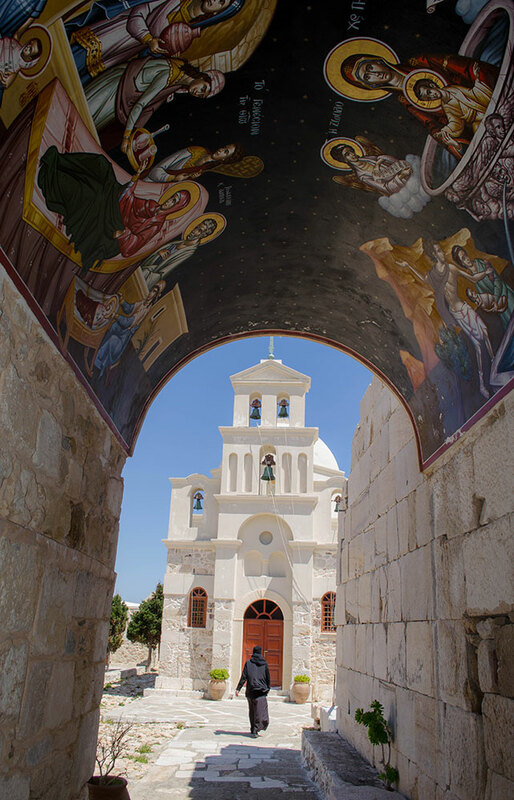 Kleisidi is 2,5 km from Chora and can be easily accessible either by car or bus. It has large sandy beach with clear blue waters which is usually busy in the summer, since it is one of the three easily accessible beaches on the island. Agios Nikolaos, the island’s port, or “Yalos”as the locals call it, is only inhabited during the summer months. It is 3 km from Chora and can be reached either by car or bus. The island of Anafi has beautiful sandy beaches and interesting rocky coastlines. Their pure and untouched exotic scenery constitutes a comparative advantage fornature lovers. On the south side, the beaches are sandy, windy and more popular. The port of Agios Nikolaos is the busiest part of Anafi. It is provided with the basic facilities a tourist would need, such as taverns. The best way to make the round of the island and stop to some of its secluded beaches is by small tour boats. Those who love fishing will find a wide variety of fish (underwater or offshore) in the blue waters of Anafi. Flamourou is a small sheltered baywith golden sand and crystal waters on the southern part of Anafi, right next to Katsouni beach. It is ideal for relaxation and isolation, as is it not very popular. The path leading to the beach starts from Kleisidi. Prasies (Monastery) is a large beach with thick golden sand and small pebbles right under Mount Kalamos. It was named after the Monastery of the area. You may find a few campers here. Prasa is a small pebbled beach on the western part of the island. Prasa is one of the few beaches in the island that can be reached by car. Still, it has fewer visitors than the beaches on the southern part of Anafi. Mega Potamos is a two bay beach, one with a long sandy coast and one with pebbles. The beach has crystal clear waters and a beautiful view to Mount Kalamos. Livoskopos is a gold sand beach on the northern side of the island. It can be reached following a path next to the main road. It is better to be visited when there is north wind. 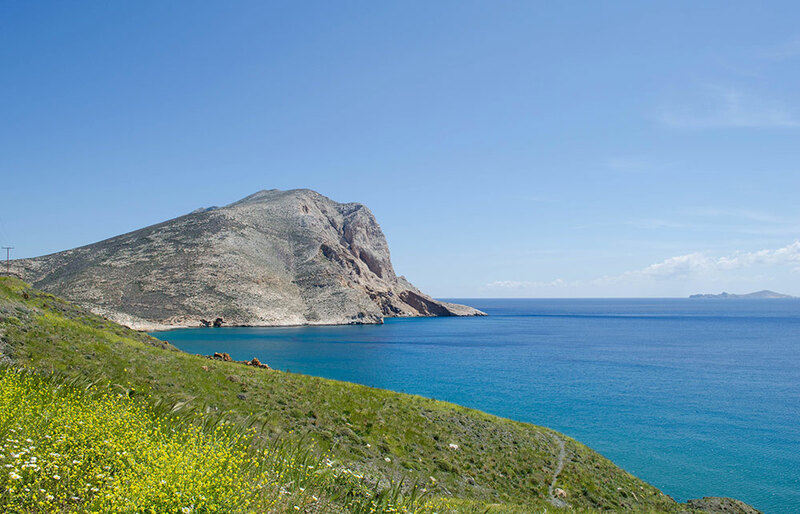 Kiparissi (Kammeni Lagkada) is a pebbled coast surrounded with big volcanic rocks on the southwestern side of Anafi. This secluded beach is preferred by those looking for some privacy and quite. There is also a café-restaurant. Agios Nikolaos (Port) is a few meters from port with crystal waters and great golden sand. It has touristic amenities, such as a small cafe, some taverns and rooms to let, and attracts lots of tourists. It is ideal for families. Katsouni is a sandy beach with colorful rocks a few minuteswalk from Kleisidi beach. It is a quiet beach and often attracts nudists. Roukounasis the largest beach in Anafi and one of the island’s most popular beaches. It has nice thick golden sand with small pebbles and tamarix trees that offer natural shade to the visitors. Campers and nudists usually set up tents under the trees. Food and accommodation facilities are available. Mikros Roukounasis a small quite beach near Roukounas beach with sand and peddles. Some food and accommodation facilities are available. Katalimatsa is a small sandy beach where the ancient port used to be surrounded by red rocks. Vagia is a large isolated beach with large pebbles, surrounded by rocks cliffs. Agios Georgios (Vrysi) is a rocky beach with clear blue waters. The beach got its name from the small chapel of Agios Georgios. It can be reached by boat, as it is rather far from Chora to be reached on foot. 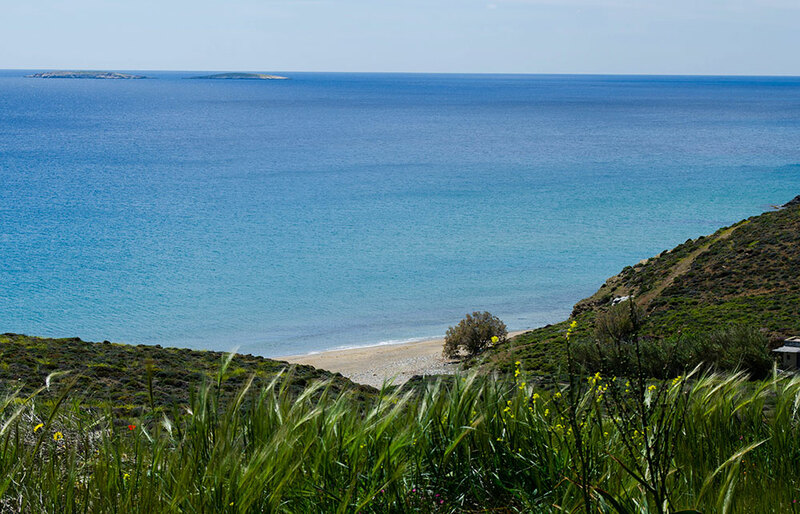 Kleisidi is a long beach withcrystal clear waters and golden sand very close to the port of Agios Nikolaos. 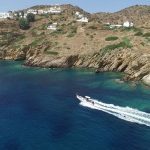 It is easily accessible and highly preferred by visitors due to its proximity to the port and Chora. Food and accommodation are available. Agioi Anargyroi is a nice sandy beach with crystal clear waters, surrounded by rocks . It’s in walking distance from the ancient temple of Apollo. The beach got its name after the church of Agioi Anargyroi nearby. and legend has it that anyone who swims in its waters will soon get married. According to the myth, Anafi rose from the sea to provide shelter for the Argonatus and to protect them from the wild sea. The Argonatus were sailing in the darkness, desperately asking for Apollo’s help, who revealed the island of Anafi. 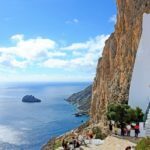 They named island “Anafi” due to its appearance (“anefani”=appeared in ancient Greek) out of nowhere and built the Temple of Apollo to honor the God. Remains of the ancient Temple can still be seen today in the ZoodochosPigis Monastery. During the 8th century BC it was colonized by the Dorians. During the 3rd -2nd century BC (Hellenistic Period) the ancient city in Kastelli was prospering. Apollo Temple and the old port of Katalimatsa were created. Kastelli even had its own currency with the image of Apollo Aiglitis on the one side and a crate with a bee on the other, denoting the growth of beekeeping activity on the island, preserved to this day. Later, Romans conquered Anafi and made it part of their empire. Statues and sarcophagi from this period are displayed in the Archeological Collection in Chora. In 1207 the Venetian occupation begins. In 1307 Byzantine rulers take over the island, only for the Venetians to come back until 1537. During this period another settlement is established in the area where Chora is today, and a lot of fortifications were built in Mount Kalamos. Vigla, the islands’ highest mountain was used as an observatory. Agios Antonios byzantine chapel is the only monument from this period. In 1537 Hayreddin Barbarossa, Ottoman Turkish captain, concurs the island. During the Otto’s reign, Anafiotes and other experienced builders from Cyclades moved to Athens to build King Othon palace. They chose the foothills of Acropolis, Plaka, to build their homes in the traditional architectural style of their island, literally integrating them on the rock. The district today is known as “Anafiotika” and is considered one of Athens architectural gems. In 1832, after the dismiss of the Ottoman Emprire, Anafi officially becomes part of the modern Greek state. Fresh pasta (balotia), sweet cheese pies made with local eggs and myzithra cheese (melitera), honeyed dough strips dredged with sesame seeds or coconut (xerotigana), cheese bread with saffron (saffron bread), fine dough crescent rolls with sesame seeds, sesame seeds mixed with honey and cinnamon (sesame honey), walnuts and honey (yemista), and pure Anafi’s honey mixed with blanched almond (koufeto). Wine, olives, honey and thyme are important part of Anafis agriculture. In local shop you can find pure and tasty products of high quality and intense aroma: thyme honey, olive oil, goat cheese and ladotyri yellow cheese, local wine called strofyliatiko, raki with pomerangade, great quality herbs (thyme, oregano, sage), caper leaves, piney chivory and crithmun. Argonaftika traditional festival at Chora square, with live music, folklore art and photography exhibitions, organized and hosted by the Municipality of Anafi, the Cultural Association and the Association of Anafi’s Citizens. 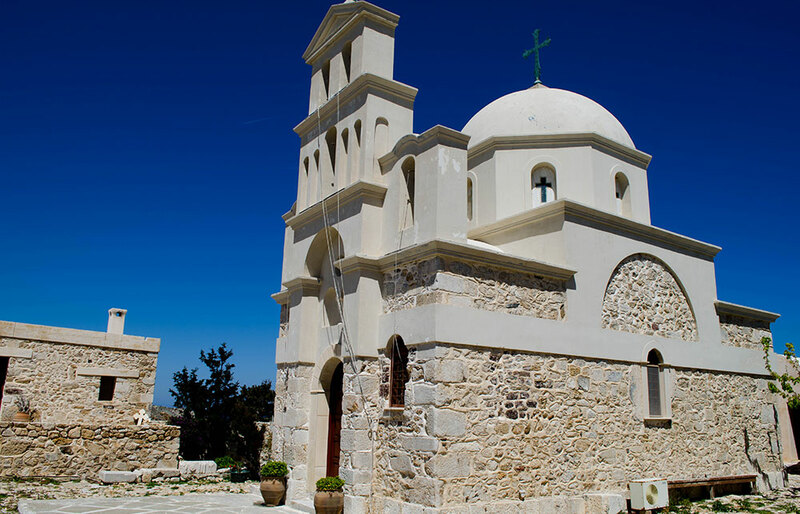 Panagia Kalamiotissa Monastery festival (September 7-8) the islands most important celebration. The icon of the Virgin Mary (Panagia) is carried by locals to the old Panagia Kalamiotissa Monastery where an all-night ceremony is held. The participants leave the monastery the next morning. The feast also features local specialties. Yakinthia (August) sports competition organized by the global Association of Anfians. At the festival’s final day an open air village fest takes place in Agios Nikolaos square in Chora with music, dancing, wine and food.